A Rhine River Cruise is an absolute must and one the most enjoyable ways to admire the local scenery. If you are on vacation in Germany, then Rhine river cruises are an absolute must to spot Rhine River Castles. A Rhine river cruise is a great way to see many cities along the Rhine river and also some neighboring countries such as the Netherlands and France. The Rhine River, also known as the Rhein in Germany, is a very important water route; it connects Germany with many other Western European countries. Some of the most beautiful castles in Germany are located along this river, so taking a Rhine river cruise tour offers stunning views worth enjoying. When I was a little kid, my grandparents took me on my first Rhine river cruise to spot the Rhine River castles, since than I took many more. The “Köln-Düsseldorfer Deutsche Rheinschiffahrt AG” (KD) is one of the largest and best Rhine River cruise companies in Germany. KD’s ‘white fleet’ of 14 different vessels has been cruising along the Rhine for more than 185 years now. If you don´t have much time you can still discover Germany’s Rhine River on a half-day or day trip from Frankfurt. Travel to the Rhine Valley by luxury air-conditioned coach, take a steamer boat (Goethe) and have a look at the romantic villages, pretty vineyards and medieval castles, followed by a wine-tasting session and dinner. 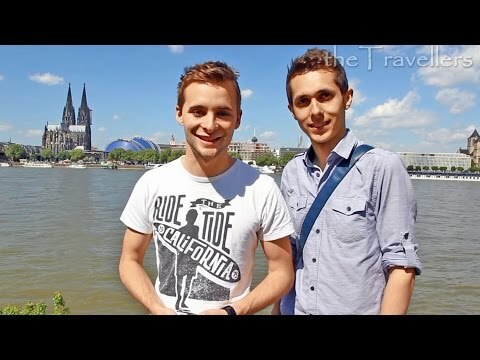 Rhine River Cruise – What´s the best time of year for a river cruise? The best time for a Rhine river cruise in terms of weather is usually in July and August. If you want to enjoy the famous Rhine in Flames come between June and September. Next “Rhein in Flammen” takes place on July 1, 2017 between Trechtingshausen and Bingen/Rüdesheim and till September on four more locations along the Rhine gorge. But even late November and December have their highlights. When it comes to the most beautiful Christmas markets in Europe, nowhere does it quite like Germany. Discover the origins of cherished holiday traditions on a Rhine river cruise to Christmas market that showcases seasonal treats and spectacular holiday décor. Tip, try to go midweek as the markets will be less crowded. The Rhine was born in Switzerland, at Rheinwaldhorn Glacier 3353 meters (11000 feet) above sea level, and then flows over a thousand kilometers to the mouth of the North Sea. In his journey, crossing Switzerland, Liechtenstein, France, Germany and the Netherlands; he is passing through a large region that is home to more than thirty million. Highly recommend: traveling the Rhine from Basel to Amsterdam in style aboard the “SS Antoinette”. This riverboat will exceeded your expectations in every way, there is even a pool! No hassle on a Rhine river cruise. The pace of Rhine River cruises in Germany, as opposed to speeding trains, the highways and, above all, to the thunderous flights, is what can make all the difference in a hectic schedule. After each bend in the river, another medieval town and castle appears. It´s like a symphony to the rhythm of the waters, the lovely landscape and the refreshing breeze makes this journey pleasant. Cruising on the Rhine can be made in various sections, in various ways and in one way or another, but certainly the stretch between the cities of Mainz and Koblenz, known as the Route of the Medieval Castle is one of the area’s best attraction and best part of a Rhine River cruise. Every day and every hour, you can see dozens of boats that come and go along the river, uniting more than thirty cities and towns. There are Rhine river cruise lines and companies that allow you to buy a pass for several days, during which one can get off the boat, visiting the cities and castles of choice, and back to get on the next boat. 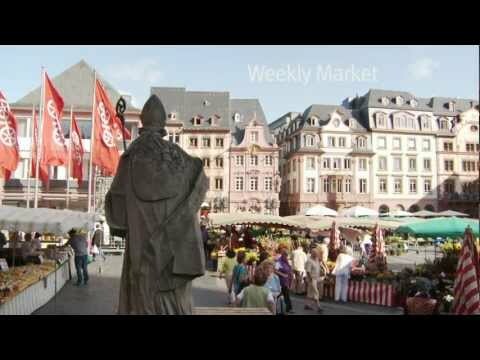 Mainz is a great starting point because of its proximity to the city of Frankfurt and its international airport. About 44 kilometers (27 miles) separate the two cities. In just 30 minutes you can make the trip from the airport to the heart of Mainz by car, taxi or train, by bus in 50 min. Mainz was founded in 13/12 BC and has plenty of attractions with its two thousand years of history. In the city they have found the remains of what was once the temple of Isis and Mater Magna, as well as remains of boats that were part of the war fleet of the Roman Empire. #1 A visit needs to include Mainz Cathedral (also called St. Martin’s Cathedral or Mainzer Dom), one of those German treasures dating from the early Middle Ages. It´s located on the Marktplatz, or Domplatz, the square in the heart of historical Mainz. #2 Another attraction is the Gutenberg Museum, which offers a journey through the history of printing. Johannes Gutenberg, the most famous son of the city of Mainz, invented the printing press in the 1450’s. Mainz is a picturesque old town, consisting of houses with ornate facades, lovely squares and inviting cafes and taverns. Have a look at the best Mainz hotels right here on TripAdvisor! #3 Kirschgarten is such a cute place and one of the must to see if you are in Mainz. A little square with lovely historical buildings, nice shops, and Dr. Flotte’s legendary bar/restaurant at one end. #4 The Temple of Isis & Mater Magna is hiding in the basement of a shopping centre (Roemerpassage), here you can step back in time to walk with the Roman Gods. #5 Kupferberg Sekt Cellar Tour & Tasting – If you are interested in wine, and in particular sparkling wines, you will definitely enjoy this tour. Leaving Mainz behind you´ll soon see Eltville on the right. Eltville is a special pearl of the Rheingau and is well known as the city of the wine and roses. It is also famous for its vineyards, sparkling wine and its castle. The “Kloster Eberbach” (abbey) in Eltville is a center of attraction for visitors as scenes from the movie “In the Name of the Rose” where shot here. Rhine river cruise up or down between Mainz and Cologne and disembark as often as you like at any of the interesting stops. The “KD Rhine Pass” is valid on all scheduled KD day cruises between Mainz and Cologne, as well as the Moselle between Koblenz and Cochem. In the small strip of flat land between the waters of the Rhine and the hills crowned by castles, quaint villages have been developed, such as Rudesheim, which appears after a few minutes of sailing from Mainz. Rüdesheim, appears consists mainly of souvenir shops, restaurants and small hotels. It´s fame is related to the narrow alley Drosselgasse (thrush alley), who seems to have the highest concentration of taverns across Europe, many with their own bands who play German folklore while running sausages and beer. A picturesque spectacle worth a stop. A cable car ride to the Niederwald Monument is another highlight and not to be missed. Opposite the village of Bingen is the Mäuseturm (Mouse Tower) which served as a toll and signal tower, because this was considered a dangerous section of the river. Facing the narrowest part of the “Rhine River Valley” begins the parade of castles. Please follow the link to have a look at our detailed guide, map of the Rhine river and KD Rhine cruise timetable . Rheinfels Castle is located on a spur of rock right at the beginning of the Middle Rhine Valley, on the left side of the river. It was constructed around 1316-1317 and important for its strategic location. Followed by Sooneck Castle, the early history of it is clouded in mystery but it is believed that it was built in the 11th century. Next on the left is Reichenstein Castle (Burg Reichenstein), also known as Falkenburg, it first appeared in the historical records of Ulrich of Reichenstein in the year 1230. The Island of Pfalzgrafenstein appears later, sporting a unique nautical design which seems to float in the stream. In the hills above the town of Oberwesel, the castle Schönburg stands today as a hotel and restaurant in which you can enjoy the original medieval atmosphere. Near the town of St. Goarshausen there is the Lorelei rock, which although a bit more spectacular than others, is responsible for the Rhine river cruise season with a dash of a fantastic story. At this point, where the Rhine turns sharply and the current becomes treacherous, poems had created a girl of remarkable beauty named Loreley. Sitting on the rocks, in the style of Greek sirens, the nymph drew their songs to sailors on the Rhine who came to death on the rocky shore. Crowning the hills behind St. Goarhausen are two of the most famous castles of the Rhine, the Burg Maus (Mouse Castle) and Burg Katz (Cat Castle). Another attractive villages appearing before reaching Koblenz is Boppard, offering an attractive Romanesque church, and lovely views of cobbled streets, half-timbered houses and outdoor markets. If weather permits, the easiest to appreciate the romantic views at every bend in the river landscape is sitting on the top deck. Even more enjoyable is the on board restaurant service and a glass of wine from the region. It is important to mention that the quality of wine from the Rhine valley is being rediscovered by winemakers thanks to grapes very features like ‘Gewürztraminer’, the ‘Sylvaner’, the ‘Müller Thurgau’, the ‘Grüner Veltliner’ or ‘ Riesling ‘, which can only get their unique taste on the slopes of the river. In the final leg of the course the last two castles appear – Marksburg and Stolzenfels Castle. Marksburg was never destroyed and is perhaps the most impressive of all Rhine castles. Stolzenfels Palace, built in the twelfth century, was destroyed by the French in 1689 and was rebuilt by the Prussians in 1836. Now we are at the port of landing of this journey, Koblenz. The city which emerges from the shadows of history was founded in 9 BC by Consul Nero Claudius Drusus, and is right at the junction of the Rhine and Moselle rivers. Take advantage of the “KD Rhine Pass” for KD Rhine river cruise Germany on the Rhine River or Mosel, you can disembark as often as you like at any of the interesting stops. Koblenz is located on both banks of the river, and has been an important defensive and economic center. Its strategic value can be seen in the remains of the old fortress of Ehrenbreitstein, which dominates the right bank of the Rhine. The German Corner, or Deutsches Eck, refers to the long slip of land between the Rhine and Mosel rivers and looks very much like the bow of a ship. Here the spectacular 37-meter-tall equestrian statue of the old Emperor Wilhelm I is located. The beautiful Rhine Gardens (Kaiserin-Augusta-Anlagen) are a beautiful stretch along the promenade and walkways connecting the green spaces on the east bank of the Rhine, it extends upstream from the Electoral Palace to the isle of Oberwerth. Bonn and Cologne are obligatory stops on German Rhine River cruises. Further north past the Seven Mountains and Nonnenwerth- and Grafenwerth-Island you reach Bonn, a city that until the fall of the Berlin Wall and reunification of Germany was the capital of West Germany. Drachenfels (Dragon Rock) in Königswinter at the foot of the Siebengebirge, is home to one of Germany’s most famous legends. It was where Siegfried, the hero of the Song of the Nibelung, slayed the dragon. You can take the tram to the ancient ruins or Schloss Drachenburg Germany overlooking the Rhine river. Drachenburg is not a real castle actually, but a private villa in palace style. Well it looks medieval but was constructed in the late 19th century. Walk around the beautiful gardens, or take a rest at the nice restaurant attached. A guided tour is essential, the entrance is reasonable 6€. The Rhine valley gets flat now and only a few miles down the Rhine we reach Cologne. This town deserves a special stopover to visit the famous cathedral and other attractions. Relax on a 3-hour Rhine River dinner cruise, enjoying panoramic views and see top attractions of Cologne as you dine. With this KD Rhine river cruise complimentary drinks from the bar, including fresh Koelsch, the famous local beer, are included. #1 Cologne Cathedral (Kölner Dom) is a must see. The giant Gothic cathedral, which had been under construction for over 500 years and was finished in 1880, is perhaps Germany’s most famous religious structure and serves as the defining symbol of Cologne’s skyline. Entrance free. #2 Köln Triangle: The skyscraper offers commanding views of the Cologne Cathedral and the surrounding area from its Panorama Observatory. There is also an restaurant and changing exhibitions. Entrance to the viewing platform 3€. #3 Roman-German Museum (Römisch-Germanisches Museum) has an impressive collection of classical art, including the famous Dionysus mosaic, an excellent collection of glassware, and tons of Roman artefacts. Admission 7€. Have a look at the best hotels in Cologne right here on TripAdvisor. #4 Claudius Therme is a really nice place to relax with different swimming pools and saunas, a wide choice of locations inside spa centre. This is a great way to wind down after a long day of sightseeing. #5 Flora & Botanical Garden consists of 2 historical parts: the “Flora” and the “Botanic Garden”. Cacti and plant houses make up this garden, which dates from the 1800s. Serene, stately, well-designed and well cared for, it´s Cologne’s most beautiful park. Until ten years ago bathing in the polluted waters of the Rhine was unthinkable. Thanks to an aggressive recovery program, the river got rid of industrial waste. Today it´s possible to fish and swim in the Rhine again. Before reaching the mouth of the cold North Sea near Rotterdam, the Rhine has touched Switzerland (it´s birth is in the Alps), Liechtenstein, Austria, France, Germany and the Netherlands. A Rhine river cruise marathon of countries and cultures in just 1,300 kilometers (800 miles).